I am so excited to announce that, with the help of Kelby Bowers, we will be hosting a workshop to help you learn how to ride bikes in traffic. This is a series of 4 bike rides, every Monday, during the month of May (except Memorial Day). Kelby has hosted numerous beginner bike rides throughout the city for years and years. 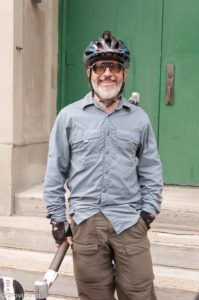 He is an avid cyclist and bicycle commuter with a vast knowledge of bicycle laws and our rights as bicyclists. Most importantly, he can teach you how to ride your bike safely in traffic. Please join us! During Bike Month (May), SPUN Bicycles is hosting the Urban Bike Riding 101 Workshop. This workshop teaches bicycle safety to adults through the relative safety of riding on the neighborhood streets of Northside. We will build stamina and gain confidence by practicing how to get from here to there in an urban setting. There are 4 rides planned, every Monday, except for Memorial Day. DESCRIPTION: Introduction to urban riding. Adults only. WHO: Adult cyclists who want to ride on the urban street safely and confidently. WHEN: May 1st, 8th, 15th, and 22nd at 6:30 pm sharp. WHERE: Hoffner Park (Hamilton Ave. and Blue Rock) in Northside. REQUIREMENTS: You, your roadworthy bicycle, your helmet, and lights. 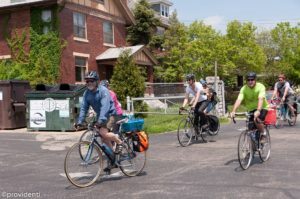 GOAL: To slowly and comfortably build each participant’s confidence and stamina so that each participant will be comfortable riding through Northside’s neighborhoods. 1. Build bicycle confidence and stamina. 3. We ride as fast as the slowest riders. — Adults can learn bicycle safety by riding slowly through the streets of Northside.